Those of you who follow this blog know that I like to cook seasonally. If you grew tired of my zucchini recipes this summer, or my green tomato recipes last month, you’ll be pleased to see that the seasons are once again changing, and my cooking is heading again in a new direction. 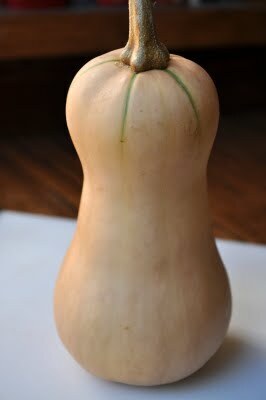 It’s the season for winter or hard squash, and isn’t that the cutest one you’ve ever seen? Unlike summer squash which must be refrigerated and which spoils within a few days to a week, winter squash can sit on the counter and most of them last weeks if not longer. I try to make sure I use them up before they start feeling a bit soft or looking a bit wrinkly. 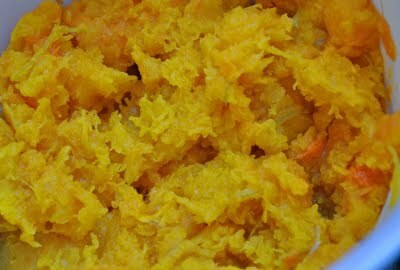 To kick off my squash posts, I thought I’d do a quick post about how I like to cook butternut squash and link to the recipes I’ve already shared with you. Then you can look forward to new recipes using spaghetti squash, butternut squash, sweet sugarloaf squash, and whatever else I end up with from my farm or the market. 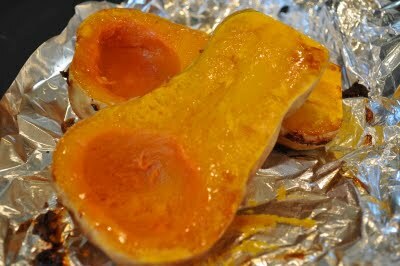 I like to roast squash because it takes on some of that lovely flavor you get from caramelization, but you can also steam or boil it. If you are going to steam or boil it I would use a Y-shaped vegetable peeler to peel it from top to bottom first. 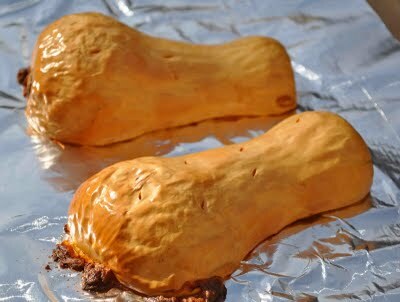 For roasting, leave the skin on. Next cut off the top stem and then cut it in half lengthwise. Use a spoon to scoop out and discard the seeds. To boil it, cut it in cubes and simmer in boiling water until fork tender. To roast, put the two halves cut side down on a baking sheet, prick the outside skin with a knife to let steam escape, and cook in a 375 degree oven until tender. …then mash it up with a fork. At this point you can eat it as is with some butter and salt (and maybe a little cinnamon or nutmeg). Or you can freeze it in a plastic bag for later use, like in the butternut squash ravioli with sage brown butter sauce recipe I’ll be making soon and posting. For now, try out this Pasta with Sausage and Butternut Squash or Butternut Squash and Fennel Soup, or this incredible looking dish from fellow Canadian blogger Kevin at Closet Cooking, Roasted Butternut Squash with Caramelized Onions, Gorgonzola and Crispy Fried Sage. I plan to try it for sure!